We've had our egg laying chickens for about 8 months. It's my first experience raising chickens and there has been a lot to learn. When we first decided to raise chickens our coop was not yet constructed, but we went ahead and made arrangements to buy a half dozen pullets (young hens) from a nearby farm. Since our farm was not equipped with a space suitable for raising baby chicks, buying pullets was our best option even though it cost a bit more than if we had bought the chicks ourselves. Most of the farms in this area get their baby chicks by mail order and our chickens are no different...they came to Concho by mail. Our chickens were raised by Moonrise Farms until May, when they were 8 weeks old and in their pullet phase. Spring has a way of sneaking up and we were still clambering to get our chicken coop together in time to receive our chickens on delivery day. With a few extra hands to help and a lot of long days we managed to get the coop fully built on time. When the time came to pick up the chickens, we realized that we hadn't really worked out a good method for transporting the pullets. In a pinch, we emptied out our largest plastic storage containers and used those for carrying the chickens. Thankfully the chickens only had to ride in the back of the station wagon for a couple miles. We've since bought a large animal crate that will work much better for transporting chickens. We're also fixing up an old truck, which will be better suited to our farm needs. When we first brought the pullets home, we put them on a diet of chicken starter crumbles. When they started to lay eggs we changed their feed over to chicken layer pellets. Our chickens seem to prefer the pellets, though other folks say their flocks prefer the crumbles. We use a 40 pound hanging feeder, it works great because it prevents chickens from stepping into the feed trough and fouling the food. Hanging the chicken feeder will also keep mice from getting into it. Currently we supply fresh water to our chickens using a five gallon galvanized chicken waterer on simple cinder block platform. Having the waterer up off the ground keeps the water supply clean by preventing chickens from easily stepping into the trough. We've done our best to discourage our hens from sitting on top of the waterer and have placed a chicken wire "crown" on top of it. Availability of fresh water affects egg production and we frequently wash out and refill the waterer. Our flock is particular about their water and if the waterer runs dry they make quite a fuss until the matter is addressed. We are moving towards an automated watering system. Once it is in place we will eliminate the task of filling the chicken waterer and our chickens will always have access to an uncontaminated water supply. Click here to download a PDF version of our automated watering system that we are designing for use in our barn and garden. At night chickens like to roost. We've given our chickens several bars to stand on while they sleep. The roosting bars are all at the same height (about three feet off the ground) and provide enough space for all the chickens to stand comfortably, shoulder to shoulder. We originally used a ladder like design for our roost, but all of the hens wanted to be on the top rung! I've read that sometimes you need to show your chickens where to roost if they don't do it instinctively, but our chickens had no problems finding their roost. After getting our first flock settled we expanded almost immediately by adding another 6 pullets for a total of 12 egg laying hens. The addition of new chickens caused a degree disruption in the hen house that we weren't really expecting. In the future we'll merge 2 flocks by keeping them side by side in a divided coop until they became familiar with one another. The dozen chickens that we have are of two breeds: Leghorn and Rhode Island Reds. The Leghorns are white and have proven to be very good producers. They started laying eggs about a month before the Reds and consistently produce large or extra large white eggs. 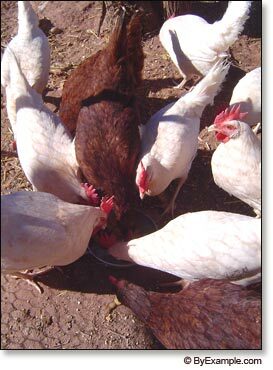 The Rhode Island Reds have a more friendly disposition and lay brown eggs. They are a little larger in size than the Leghorns and seem to be moderate producers. Because of their continuously high productivity, we've already determined that our next flock will also be Leghorns. The chart above compares our 2 breeds and illustrates the superior production levels exhibited by the Leghorns. While our flocks were still getting settled we had a lot of trouble with egg eating. To read about how we corrected the behavior see the following articles: Chicken Coop Plans and Chicken Nesting Boxes. 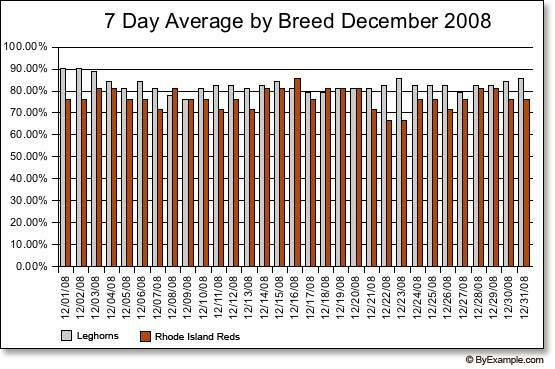 We've been monitoring egg production for the last 2 months and have been amazed that our number of eggs per day have been fairly steady even through the winter. We'd heard about chickens not laying eggs or only laying a very few eggs through the cold winter months. We have been surprised to find that our chickens have continued to produce eggs and attribute it partly to the warmth of our insulated passive solar barn. Winter temperatures inside the barn, which is partially devoted to our chicken coop range from 35 to 60 degrees Fahrenheit. We will continue to monitor egg laying behaviors in order to learn more about how different factors effect egg production. 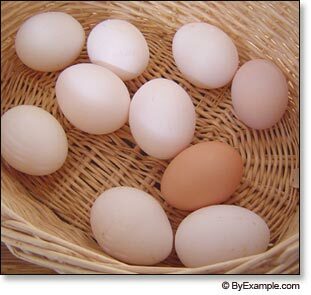 In theory each chicken can lay one egg per day. In our flock if a dozen eggs are laid in one day it represents 100% productivity. At our current average of 80% productivity our 12 hens lay 9 to 10 eggs per day. In early November our average productivity was higher at 90%. We believe that the reduction in egg productivity can be attributed to the colder winter temperatures and shorter daylight hours. We've also begun to track food consumption. In our insulated passive solar barn our 10 month old hens now consume layer pellet at a rate of 2 ounces per chicken per day. In the morning we throw about a pound of scratch onto the ground in the outdoor chicken yard. Throwing it onto the ground encourages the chickens to scratch for bugs and forage for food. We also throw table scraps to the chickens several times through out the day, including vegetables, meat and anything that we would eat even if it is slightly spoiled. They seem to like variety. As light began to fade this fall we installed an automated light system to supplement the sunlight coming through the South facing window of the barn. The chickens now get a total of 13 hours of light inside the chicken coop. The automatic light system consists of a photocell that senses light, a plug-in timer and a light fixture with a compact fluorescent bulb. The timer is set to turn on the light at 5 a.m. and shut off at 6 p.m. However, when the photocell senses daylight coming through the window, it cuts power to the light. 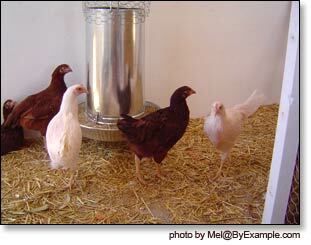 For an off grid homestead this chicken light system works great, because it minimizes power consumption and you don't even have to flip a switch. Set a basic plug-in timer to come on at 5 a.m. and off at 6 p.m.
Next plug in a dusk-to-dawn photocell (plug in type) into timer. Then plug in a trouble light and place the light in the chicken house. Make sure your timer and photocell are placed where the photocell can be activated by Sun light. The timer will provide for a 13 hour light cycle and the photocell will shut off the light when it detects sunlight. Next plug in a trouble light and place the light in the chicken house. Then screw in a duck-to-dawn photocell (screw-in type) into your trouble light's light socket. Make sure your photocell points away from the reflector on your trouble light or the light will flicker. Though we first installed communal nest boxes in the chicken coop, we quickly modified the nesting boxes to achieve better results. Click here to read about more about our chicken nesting boxes. 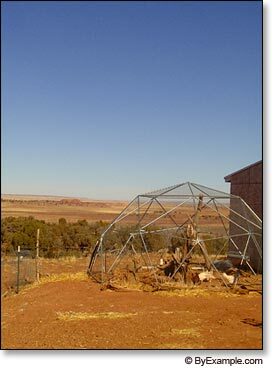 Click here to read about our self built chicken coop.